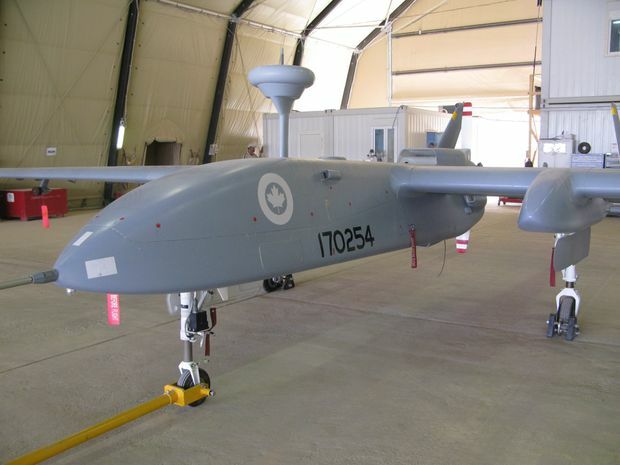 A Heron pilotless spy drone, operated by the Canadian military, sits in a hangar at Kandahar Airfield on July 5, 2010. Yet aside from purchasing a small number of temporary, unarmed drones for the war in Afghanistan – all of which have since been retired – the military has never been able to make much progress on a permanent fleet. In an interview with The Canadian Press, air force commander Lieutenant-General Al Meinzinger said he is confident that is about to change after the Trudeau government officially approved the purchase of a fleet of armed UAVs through its defence policy. That decision was one of the most notable shifts in the new policy, released in June, 2017, which included a promise to spend an extra $62-billion over the next 20 years to expand and strengthen the military. No previous federal government had authorized adding drones – armed or not – as a permanent fixture within the Canadian Forces in the same vein as fighter-jet or helicopter squadrons. While Prime Minister Justin Trudeau said the government considered the drone decision carefully, critics have noted that there are very few rules around their acquisition and use – including in assassinations. Lt.-Gen. Meinzinger said drones proved their worth to the Canadian Forces during the war in Afghanistan, where he personally commanded a UAV squadron tasked with monitoring the surrounding countryside. Chief of Defence staff General Jonathan Vance has previously said the Canadian military plans to use armed drones in much the same way as other conventional weapons, such as fighter jets and artillery.